These two dramatic one-hour programs feature John Cassavetes. They are surprisingly cinematic, especially considering the difficulties those behind the camera had to face. There were clunky cameras, hot lights, quick set changes, live music and sound effects�and they always had be mindful of keeping microphones out of the frame! The first program, entitled "Crime in the Streets," is from The Elgin Hour (broadcast live on Tuesday, March 8, 1955). It was written by Reginald Rose, directed by Sidney Lumet, and co-starred Robert Preston. The second program, "No Right to Kill," was part of the Climax! series. Based on Dostoyevsky's "Crime and Punishment," this was adapted for TV by Victor Wolfson and broadcast on Thursday, August 9, 1956. Nostalgia buffs will enjoy the original commercial messages that are included in the episode, along with a bonus blooper reel from the "Defenders" and "The Nurses" series. 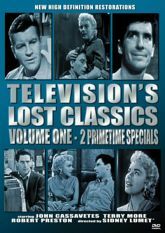 This special series of lost programs from the Golden Age of TV has been restored from the best archival film elements available. Some of the programs have not been seen since they were originally broadcast.